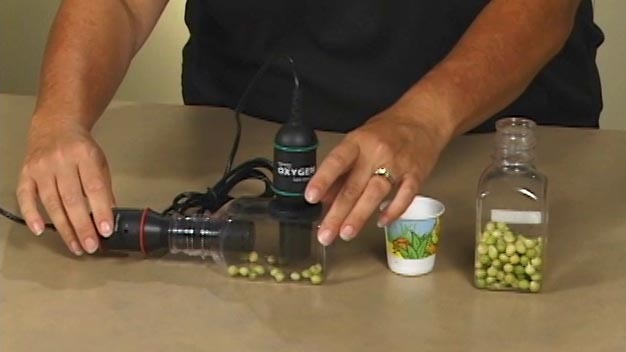 The O2 Gas Sensor can be used to monitor gaseous oxygen levels in a variety of biology and chemistry experiments. The sensor is intended for measuring gaseous, not aqueous, O2 concentrations. Connect the sensor following the steps in the Getting Started section of this user manual. Note: For best results, keep the sensor upright as much as possible. For many measurements, it will not be necessary to calibrate the O2 Gas Sensor. The sensor is shipped with a stored calibration. For more accurate measurements, the sensor can be calibrated at 0 and 20.9% oxygen. Follow the 2-point calibration procedure. For the first point, push and hold the zero button with a pointed object such as a straightened paper clip. The button is located on the side of the sensor next to CAL. Enter a value of 0 for this reading. Release the button and take a second reading. Enter a value of 20.9% oxygen or a corrected value from the table in the Effect of Humidity section of this user manual. Once finished, the sensor should now read 20.9% (or the value entered from the table). For detailed instructions on calibration see the related links below. Go to the Storage tab and click the Set Sensor Calibration button (Logger Pro) or Save Calibration to Sensor (LabQuest). Once saved, this new calibration will be used automatically, regardless of the interface to which the sensor is connected. Click Done to complete the calibration process. 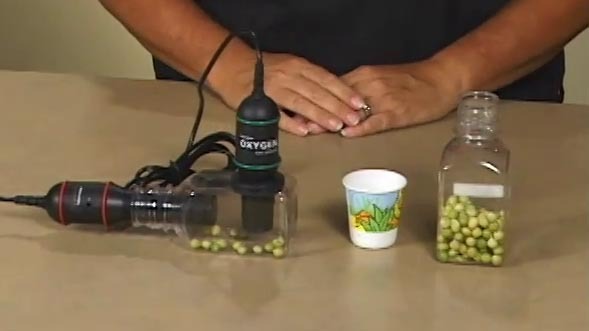 Because the oxygen concentration varies with the amount of water vapor in the atmosphere, you may want to adjust your atmospheric oxygen calibration value to improve accuracy when using the O2 Gas Sensor. The accepted value of 20.9% for atmospheric oxygen levels is calculated in dry air (0% humidity). If you know the relative humidity of the location at which you are calibrating, you can substitute one of the values below in place of 20.9%. Important: The O2 Gas Sensor must be stored upright when not in use. This is necessary to maintain the sensor. Failure to store upright will shorten the life of the sensor. As your O2 Gas Sensor ages, the readings will decrease. This is normal, as the chemicals in the electrochemical cell are depleted. It does not mean the sensor is no longer functional; rather, it simply requires that you perform a calibration and store it as described previously. Once the readings in air are below 12% prior to calibration, or 1.8 volts during calibration, the sensor should be replaced. You may choose to have your sensor refurbished and a new element installed, or you may purchase a new sensor. The Vernier O2 Gas Sensor measures the oxygen concentration in the range of 0 to 27% using an electrochemical cell. The cell contains a lead anode and a gold cathode immersed in an electrolyte. Oxygen molecules entering the cell are electrochemically reduced at the gold cathode. This electrochemical reaction generates a current that is proportional to the oxygen concentration between the electrodes. The sensor output is a conditioned voltage proportional to the reaction current. Even though the sensor responds rather quickly to changes in O2 concentration, the gas has to diffuse into the electrochemical cell located at the top of the sensor shaft before any changes in concentration can be detected. Because the diffusion of a gas is a slow process, there can be some delay in readings. To collect data in a controlled environment, we recommend that you use the 250 mL Nalgene collection bottle that is included with your sensor. Place the tip of the sensor into the opening of the bottle and push the sensor into the bottle. When the sensor will go no further, you have a seal. Very important: Do not place the sensor into any liquid. The sensor is intended only for measuring gaseous, not aqueous, O2 concentration. To collect data in a controlled environment and also use our CO2 Gas Sensor, we recommend purchasing either the BioChamber 250 (250 mL capacity) or the BioChamber 2000 (2 L capacity). Each BioChamber has a second, grommetted opening so that you can insert two probes at once. 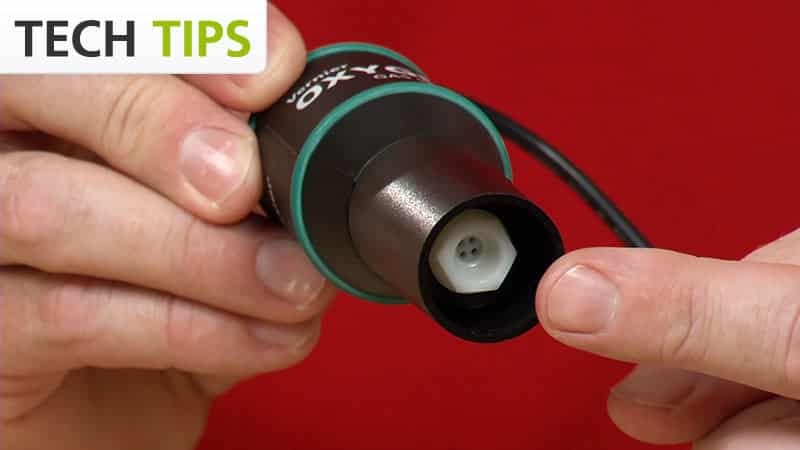 If you have watched the related product video(s), followed the troubleshooting steps, and are still having trouble with your O2 Gas Sensor, contact Vernier Technical Support at support@vernier.com or call 888-837-6437. Support specialists will work with you to determine if the unit needs to be sent in for repair. At that time, a Return Merchandise Authorization (RMA) number will be issued and instructions will be communicated on how to return the unit for repair. The BioChambers have two openings with grommets so that you can insert both the CO2 Gas Sensor and the O2 Gas Sensor to take measurements of the atmosphere inside the BioChamber simultaneously.